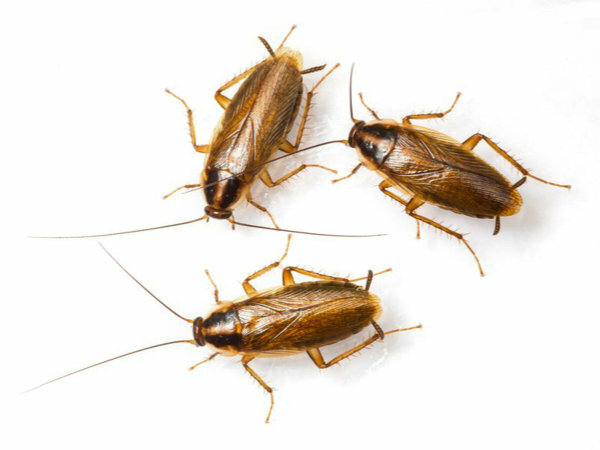 There are several thousand species of cockroaches, but these four species account for the bulk of interior cockroach infestation in the United States and North America. They're also important household cockroach species in many other parts of the world. Do-it-yourself cockroach control begins with identifying the correct specie. The German Cockroach (Blattella germanica) is the roach that exterminators are most often called upon to control in the United States. Adult German cockroaches average about five-eighths of an inch long. They have long antennae which they use to detect chemicals, moisture, air currents, and probably sound waves and vibrations in their environment. German cockroaches prefer areas that are warm, moist areas, dark, secluded and that have cracks and crevices in which they can hide. They exhibit a behavioral trait known as thigmotaxis, which basically means that they feel most comfortable and secure when they have surfaces touching their sides, back, or antennae, as well as their feet. Hence their fondness for secluded crack and crevices and other small areas. Little gaps like those formed by corner braces inside a cabinet are prime real estate for German cockroaches. In homes and other buildings, German cockroaches are most often found in kitchens, bathrooms, pantries, and other areas where they're close to food, water, and a suitable harborage area that's dark and secluded. They also typically infest the wall voids immediately adjacent to these areas, especially if there's easy access between the two such as a gap around the plumbing where it passes into the wall under a sink. Thousands of German cockroaches can occupy the wall void behind a sink, toilet, or shower, but you might never know the true extent of the infestation until you turned on the lights. Treatment of the wall voids is an essential part of an effective cockroach-control job. American Cockroaches (Periplaneta americana) are largest roaches found in homes in most of the United States and North America, commonly attaining lengths up to an inch and a half. These are the roaches that Americans often (and incorrectly) call "waterbugs." If someone says they have roaches "big enough to put a saddle on," they're almost certainly talking about American cockroaches. American cockroaches prefer dark, moist, warm areas where humans and other animals rarely enter. They are commonly found in basements, steam tunnels, boiler rooms, rubble foundations, and similar places. Often they aren't even noticed until a light is turned on, upon which they scurry away rapidly. Other places where American cockroaches commonly live are in the void areas around and under enclosed bath tubs, inside the bottoms of washing machines, inside wall voids adjacent to kitchens and bathrooms, and in crawl spaces in warm climates (or during the summer in temperate climates). One peculiar thing about American cockroaches is that adults of both sexes have fully-innervated, functional wings and at least some flight capability; but oddly enough, they seldom fly. They may use their wings to break a fall, but they rarely take off and fly. It may be that flight capability (or the knowledge that they have it) is genetic in origin and exists in only a small subset of the specie. Brown-banded Cockroaches (Supella longipalpa) are the smallest cockroaches commonly found in homes in the United States, reaching about half an inch in length as adults. Adult males are slender, have full-length, functional wings, and can fly. Adult females are chubbier than males, have wings that don't completely cover their abdomens, and cannot fly. As their name implies, brown-banded cockroaches have two light brown colored bands running across their wings and abdomen. The exact patterns are somewhat variable, but always very distinct. Like most roaches, brown-banded cockroaches are averse to light and will rapidly scurry away when the lights in a room are turned on. They have much lower water needs, however, than most other common roaches (such as the German cockroach, with which they often are mis-identified). In fact, brown-banded cockroaches' strong preference for drier conditions can be a fairly reliable way to identify them. 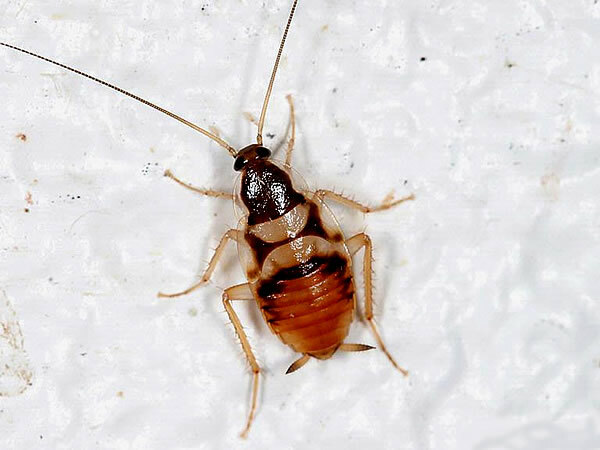 Unlike German cockroaches, brown-banded cockroaches typically are found in bedrooms (especially in closets, cabinets and night tables), living rooms, behind peeling wallpaper, and inside electrical and electronic equipment. If you have small roaches in a dry part of the house, chances are they're brown-banded cockroaches. Brown-banded cockroaches will eat almost anything, but they have a peculiar taste for certain types of wallpaper paste and bookbinding glues (especially those made from casein, a protein found in milk). In order to reach adulthood, they must consume adequate amounts of proteins and carbohydrates; and casein-based glues seem to meet those requirements. 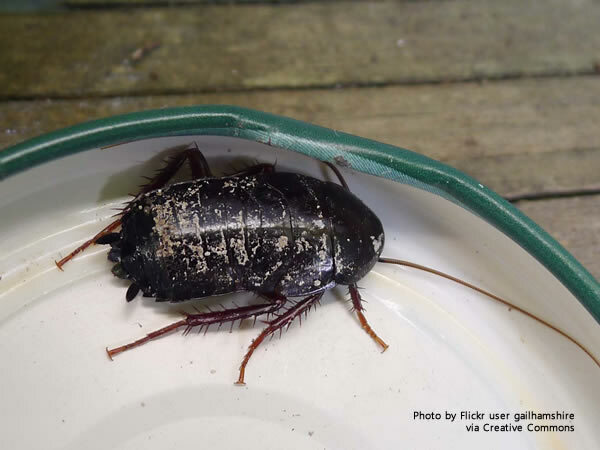 They also can survive on some soaps, cosmetics, and food scraps from a typical human diet; so as the case with most roach problems, proper sanitation is essential to brown-banded cockroach control. Oriental Cockroaches (Blatta orientalis) are black or very dark brown in color and roughly an inch in length. Some individuals have speckled markings on their dorsal surfaces. Adult male Oriental cockroaches have wings that extend about three-quarters of the way down their abdomens, but they cannot fly. Adult females have only small wing pads extending only a short distance behind their heads, and also cannot fly. Like roaches in general, Oriental cockroaches prefer secluded, protected locations. They tend to live outdoors in places like wood piles, under leaf piles or mulch, or in rotting railroad ties when the weather is warm; but they readily move inside during periods of extreme heat, cold, or drought. 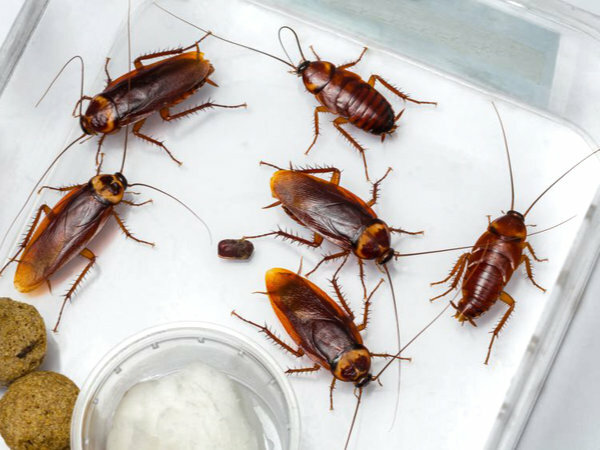 Inside homes, Oriental cockroaches are commonly found in garbage storage areas, basements,sill plates, rubble walls, under porches and decks, and in crawl spaces. They also can live in sewers, and occasionally get into homes when the plumbing traps downstream of seldom-used sinks and toilets have no water in them. Although they have a fairly low rate of insecticide resistance, Oriental cockroaches can be hard to control. Their damp habitat preferences cause liquid or dust applications to wash away or degrade; and their omnivorous feeding habits make baiting difficult because there are so many other things they can eat instead of the bait. The best approach is usually to use either an insecticide spray labeled for indoor cockroach control or a specialized cockroach bait like Advion or Invict inside the home, depending on the location; and to either caulk around the house or spray the exterior perimeter (or both) to keep new roaches from getting in.